Discussion in 'Miscellaneous Repairs & Maintenance' started by Njemtmike, Nov 7, 2018. Hi all. I am new to the pop up camper world and learning. I am thinking about taking out my gas heater and replacing it with an electric tankless system. Would this work? I just bought it and I can not get it to ignite to heat my water. 2nd @joet, you would only be able to install a small point of use electric hot water heater, one that would work for the sink but not for a shower. Why not try and fix the one you have? Do you get gas to it? I just bought it and I can not get it to ignite to heat my water. Please expand on this. Are you saying that you can't light the pilot light? There are plenty of reasons why the water heater won't ignite. Some fixes are very easy. There are plenty of 12 volt portable tank-less propane water heaters available on the market that you could try. I don't know if you could find one that would fit in the space where your present one is if that is your intention and venting may also be a problem. Do your other lpg appliances work? It always takes a while for me to get my water heater fired up each season. Sometimes it helps to get the stove working first to get more flow through the lines. I will also do the same with the heater before tackling the water heater. Are you getting a pilot flame at all? First let me thank you all of your for you reply. I did find a few small heaters that run off of 120 that could fit my needs. (I just purchased this 1992 camper and I am learning all this stuff as I go) I tried to start the heater but never got a flame at all. I could not tell if there is gas going to the heater at all. I am will be using this for commercial things when I am not camping in it and need hot water for the sink to make health inspection. My thought was that if I had an electric heater I would not have the hassle of the fire inspector. I am on the fence and not sure which side I do not want to face plant on. I am on the fence and not sure which side I do not want to face plant on. That's funny! I needed that this morning. 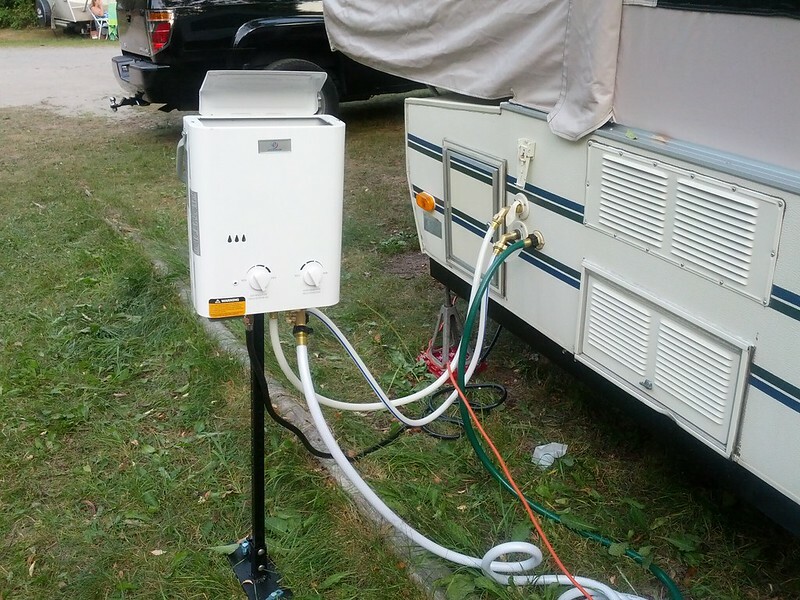 I've seen a tankless or instant heat water heaters on an overland rig or two. I think 12volt options are available. Our Vet Clinic has hot water available on their mobile vet truck. I've never seen it plugged into 110 or a propane tank on it. Let me just throw this out there. I struggled for a long time getting my heater to light. Till someone pointed out I was trying to light in the incorrect place. It's not the same model you have, but you get the concept. That looks very similar to the one on mine. I have to move the blue dial to the pilot detent and hold it there. Can take a minute or two for gas to start flowing. Even then it is only for the pilot so a very small amount of gas, and the flame will immediately go out unless you keep the pilot on long enough for the flame to heat the sensor right above. Once it stays on the main burner will flow and ignite. I assume your other lpg appliances are working? If it doesn't you may need a new thermocouple. Are you going to be selling food? You mentioned health inspection. Mostly fire will look at hoods, supression systems, extinguishers, build up of oil etc, and if you have any propane leakes. They will check with a meter. Also if takes are secured. Health will take the water temp, food temps, and cooler temps. The hot water in my pup is hot. As for the on demand types i dont know. Most food trucks have a simmiler propane hot water heater. As someone mentioned, you could opt for a portable on demand water heater also. I used to use an Eccotemp L5 when I had my popup, and loved it.